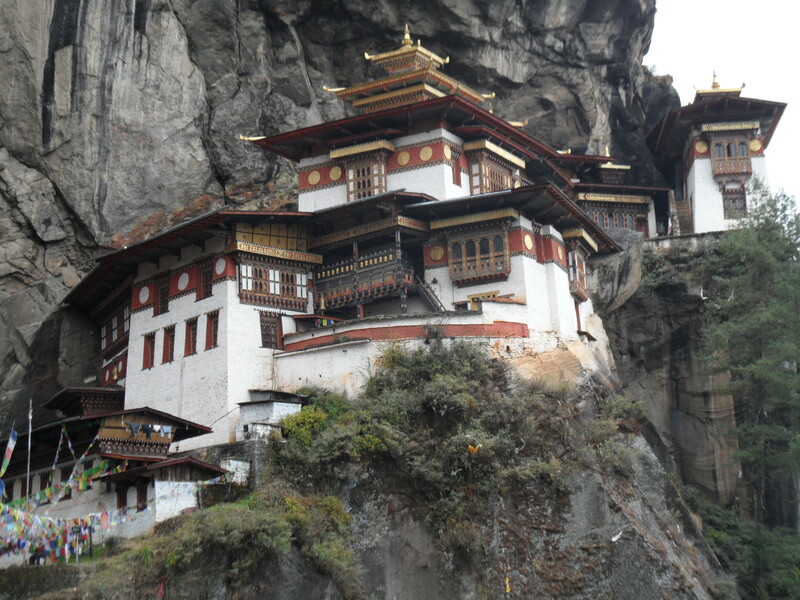 Tackling the Tiger’s Nest Monastery in Bhutan | Where to next? 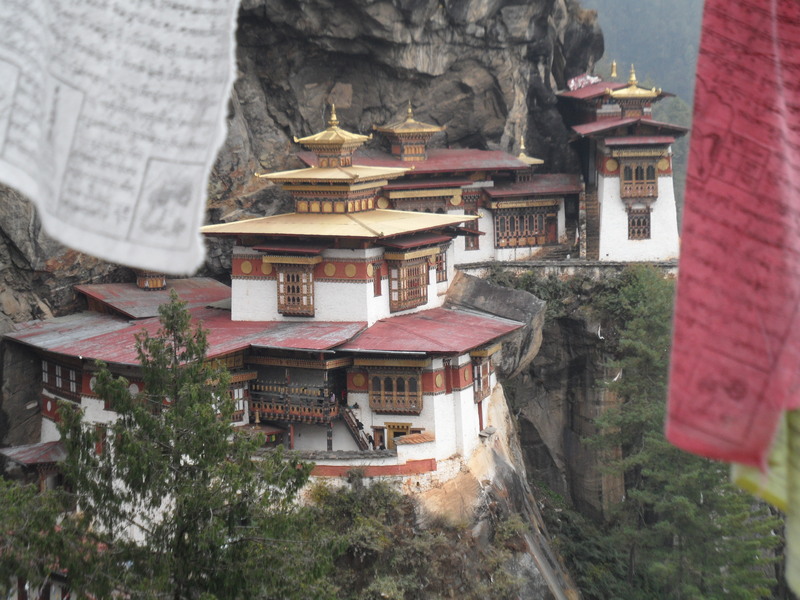 Everyone who knows anything about Bhutan and who also knows that I’ve been there asks if I saw Tiger’s Nest Monastery. Yes, yes, of course I saw it. Frankly, I’m relieved if that’s how they phrase their question. Because if they ask have you BEEN to Tiger’s Nest Monastery, I have to hang my head and admit that I got halfway there. Getting to the halfway point was enough of a struggle that I was easily discouraged from tackling the rest. So trudge along with me. We were up early and ready to go. Our guide for the day (I can’t remember his name), Anand, Deepti, Poor John and I were set to scale the hill that leads to this famous monastery. The promotional hype says it ‘clings to a cliff 3120 metres above sea level’ overlooking the Paro Valley. This is true, especially the clinging to the cliff bit. The hype also says you can make it to the monastery in two hours, and that the ‘weak and weary’ (my quotes) can take a horse to the halfway point and even a bit beyond. This is only half true, and the two-hour comment isn’t at all true. So off we set. It’s a nice gentle start up the hill and I briefly thought if most of the climb is like this, I’ll be fine. I can walk for hours on the flat or even the gentle slopes of a well-graded switchback. But then the hard slog began and the horses appeared. I think I’d like to take a horse, I told the guide. No, you don’t want a horse. They’re unreliable. Some fall down and some people even die when their horses throw them over a cliff. Oh yeah, the monastery ‘clings’ to a cliff. I wavered. I know how to ride a horse. I’ve even owned a horse. But one look at the beasts was enough to convince me that they weren’t any keener than I was to walk up that hill, so I passed up the opportunity. Better that my own legs give up and I collapse in a small heap on the ground. The plus was that I didn’t get chucked over the side by an uncooperative horse. The minus was it took me a very, very long time to get to the halfway point. The gentle slope ran out almost immediately. Then the ladder kicked in—not a real ladder, but a slope that seemed like one. Poor John (sometimes called He Who Walks Everywhere) and Anand strode ahead. Deepti and the guide lingered with me, but I shooed the guide on. Deepti is young, fit, energetic and good company. It was a pleasure to have her with me—she walked and talked, while I huffed and puffed and gasped and struggled and dawdled. Of course, I’m exaggerating, but the walk up is long, steep AND rather boring. I look back at my photos and most are of the monastery inching slightly closer in every frame. I have photo after photo of the monastery, but very little else. I usually find lots of things to snap—flowers, people, scenery—but this stroll was all about reaching the monastery. For me it was all about reaching the halfway point, which I managed in an hour and 40 minutes. When we finally arrived, I urged Deepti and the guide, who’d waited for us, to go on without me. I’ll be fine waiting here. And believe me there were plenty of other stragglers who didn’t press on to the top. 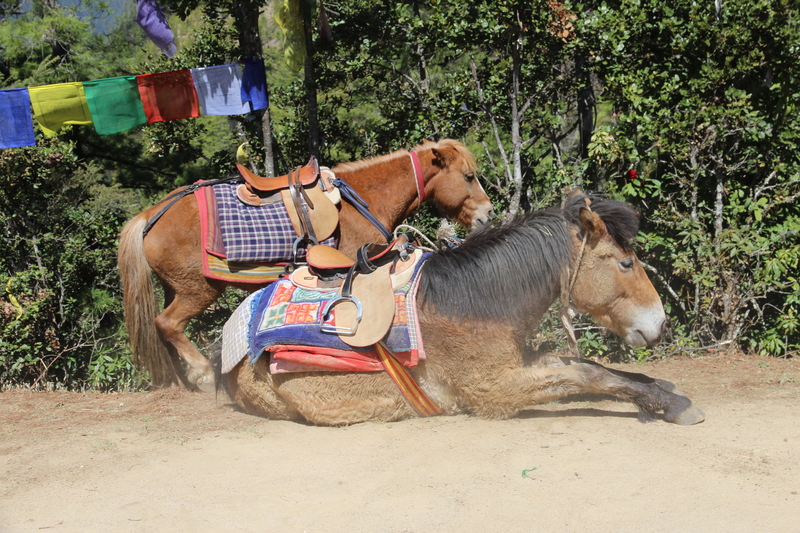 Quite a few had ridden horses to the halfway point, and one even saw a horse stumble and toss off its rider. So I allowed myself a slightly smug smile that I got that far walking. There wasn’t much to photograph at the halfway point, except a gigantic prayer wheel and endless views (mostly the same) of the monastery in the distance. But there were plenty of people to chat to and a restaurant (but we were going to lunch somewhere else later). Oh, and there was lots of hot tea and biscuits to revive us. I particularly liked the cheesy snacks, but more about that soon on another post. It was a while before the others returned, and they had many tales to tell. Poor John, who took just under two hours to get to the top, was quick to say you would have hated the second half of the trek. A lot of steep up, then a lot of steep down and then more steep more. It was exactly what I needed to hear. Then Anand and Deepti added the fact that no photos were allowed inside the monastery. Oh yay! Another reason for my ancient self to stay behind. And then an absolutely corker of a story from all of them. It seems that way back when the monastery was first built, there was a huge Buddha statue created to be displayed at the top. He’s there now, but can’t be photographed. Now I hope I get this right, and feel free to correct any mistakes. The story goes that this Buddha weighs about 8 tons (way more than I weigh). When it came time to carry him (I’ll assume it’s a him) to the top, the locals pondered how to get him there. He was way too heavy for the locals to lug up there. After some discussion, they decided to break the statue into pieces and carry up each piece individually (a plan I would have supported). But apparently the statue interrupted and insisted that he should not be dismembered. In fact, he said they should just leave him alone and he’d get himself up there. And apparently that’s exactly what he did because the locals awoke in the morning to find the Buddha positioned in the monastery. Such a pity that I couldn’t figure out how to get him (the Buddha) to teleport me up there too. That said, I’m really glad I didn’t tackle that last struggle. I always take time to go up a slope or hill, and always take caution to go down. As I often say to Poor John, The chances of me falling are slim. The consequences of me falling are huge. The guide was quick to point out that just a few weeks before we were there and on the last leg of the uphill trek, a Thai woman leaned back against a railing to take a pic, and fell to her death. So no regrets that I didn’t go the distance. 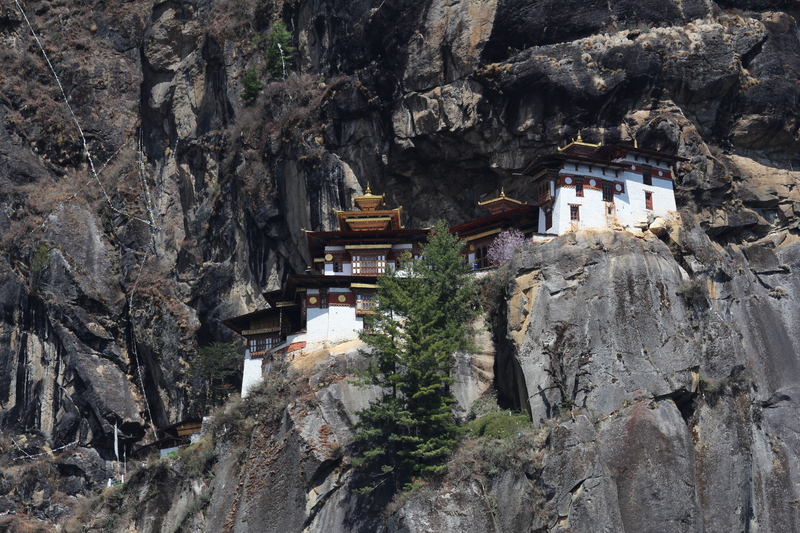 First built in 1692, Tiger’s Nest Monastery is Bhutan’s most important and most visited site. Also known as Taktshang Monastery, it overlooks the Paro Valley and really does hang off a cliff at 3120 metres above sea level. I’m so glad I started much higher up than sea level. The monastery has four main temples and a few dwellings. Most buildings have balconies with amazing views. 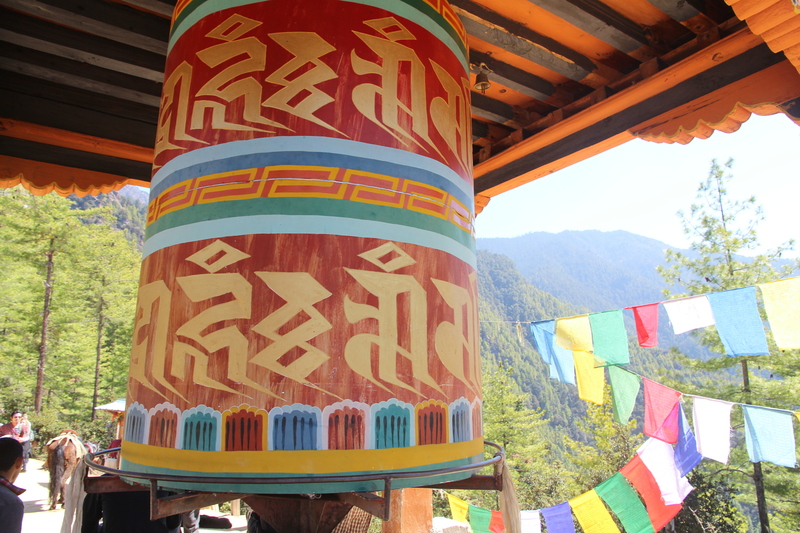 The main courtyard has a prayer wheel that is rotated every morning at 4am. There are also eight caves. Monks of the monastery are supposed to live and meditate in these caves for three years. The Hall of a Thousand Buddhas, which is carved into rock at the monastery, also has a statue of a tiger. This is important because tigers are respected symbols of the monastery. Legend says the monastery’s site was chosen by a tigress, which also explains its name. All of the monastery burnt down in 1998 and has since been rebuilt. Note: You’ll see that some of the photos are by Gary Foster. Gary travelled with us in India earlier this year, but he did not join us in Bhutan. That’s because he visited there in 2011. He graciously sent me his photos. Poor John won’t carry a camera, so I have to rely on Gary and others in these circumstances. I envy you. You were able to get that close. And your picture from the half way point is great. It was like 25 days of backpacking to northeastern states of India(Sikkim, West Bengal, Arunachal Pradesh and Bhutan). I can imagine that it was amazing. In the east of India, we’ve been to Sikkim, West Bengal and Assam, but not Arunachal Pradesh. Thank you so much for your candid description. We are going there in October. 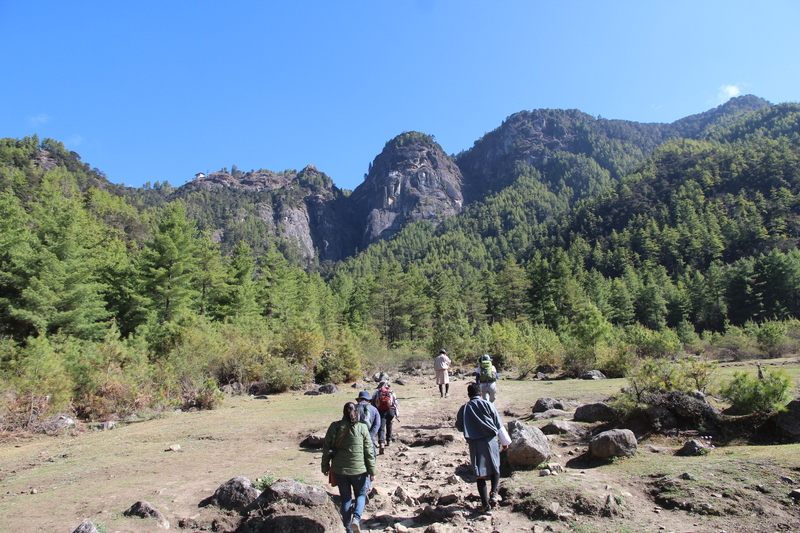 Don had assured me that there is a gentle walk to the monastery — not a difficult climb. I think he lied! 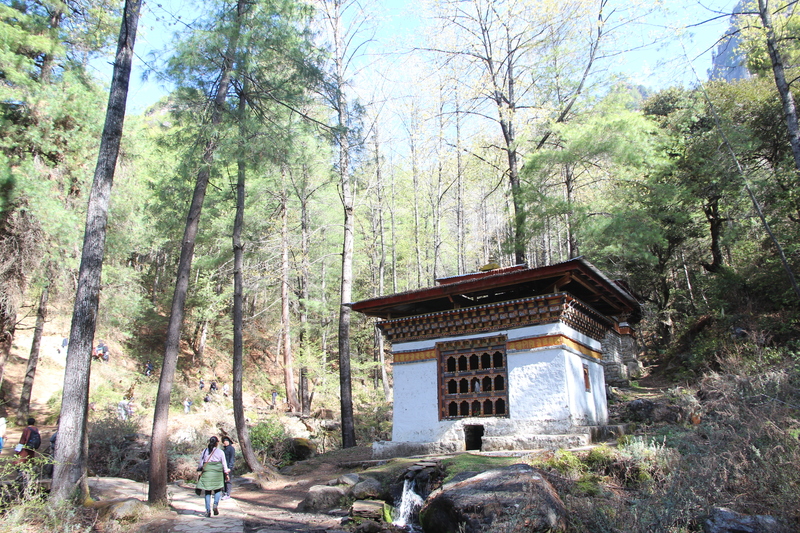 There is a smaller monastery in Paro itself and the walk up to it is not too bad. 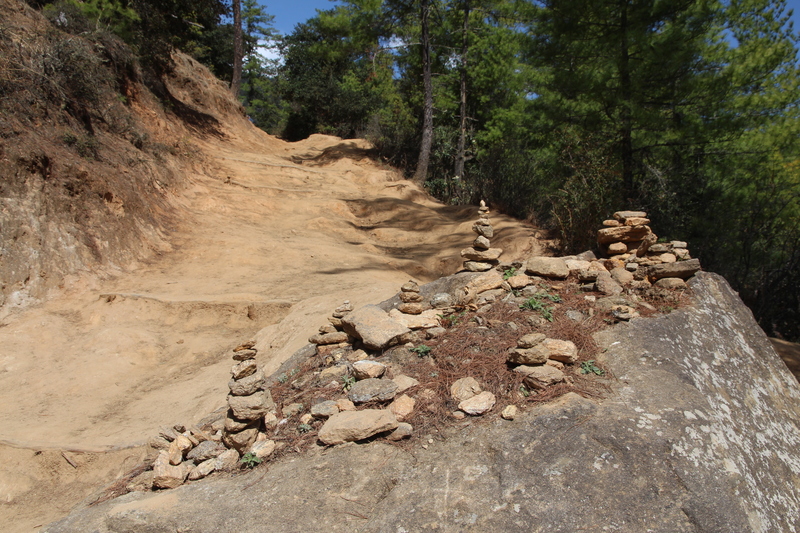 But if you want to do all of Tiger’s Nest then do some uphill training. Honestly, if I did some training, I’d have another stab at it. Especially if I had the whole day to do it and was not part of a group with a schedule to meet. Yeah, there’d have been some explaining to do if I’d gone splat. But this reminds me of the steep rocky path I had to scale down in the dark to get to the Three Blind Mice ‘resort’ on the shores of the Ganges. Another story to tell. Soon, soon. I’ll do more of Bhutan first. There is good reason why it is important to look at things/life from a distance to appreciate what and where they are. I’m impressed you got so far. And a wonderful post on a place you did not reach. Social media/blogs are full of all the amazing places reached/ things achieved but we edit out posts to these so thanks for a goal not achieved. This is amazing! The way the monastery is nestled into the craggy cliff side!!! Thanks for sharing😊! It is a truly incredible location and structure. A drone camera! What a brilliant idea. And it wouldn’t be cheating—it would be making use of technology. What an amazing place to locate a monastery and just how…….did they get all the building materials up there back in 1692 one wonders. (I suppose if the pyramids were built without modern technology, the Tiger’s Nest would be a ‘pushover’). I’m sure my Sony a6000 would be light enough to carry on these trips, but then there’s the backpack, bottle of water, waterproof jacket and so on to carry too I suppose. And…..the thinner air at that height would make the smallest weight seem like a ton. (BTW Bhutan has risen to the top of my Bucket List now that Tibet is taken over by the Chinese). I can walk slowly for a few hours, but not slopes or heights. It’s amazing how what one can achieve in physical challenges, but I’m glad you had the common sense to not continue to the top and risk life & limb & health. Sometimes in life, we have to be realistic and admit/accept our limits. Ah yes, it’s a relief when realism and common sense kick in. As for how they got that stuff up there, I have no idea, but they would have had plenty of time. I also suspect that much of the timber was cut from the cliff side. Agree. Totally. If the Egyptians could build the Pyramids and the Chinese the Great Wall, then this is a piece of cake. Bhutan is a lovely place to visit – very much similar, I am told, to India’s Sikkim but very well-developed infrastructure. Trekking, of course, can be treacherous and one must know when to stop! 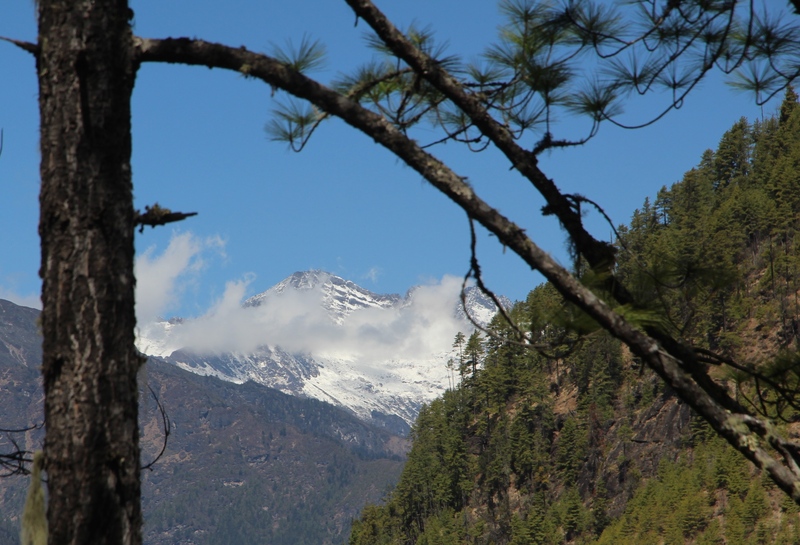 We found Bhutan welcoming and fascinating—even if we did a lot of uphill hiking. What a great story – and well told. However, after reading how hard it is to climb up the steeps cliffs and horses not being reliable… I can see why you decided to make the wise choice and turn around… I would have done the same thing! Anyway, I enjoyed your commentary blog and also obtaining some good photos to go along. Frankly Sy, I could have made it to the monastery, but not in the time available. When you are part of a group with a schedule and you’re the slow one, you have to make the sensible and timely choice. That said, I will never regret NOT doing it all. It’s good that you know your limits. Is the second part of the trail difficult only because of the steep climb or is it treacherous, even if you don’t lean up against dodgy railings? I like to think I don’t have any limits and a lot of the reason I didn’t go on is that I would have been so slow the rest of the day’s events wouldn’t have happened. So it was a trade-off. Also I think the second part of the trail is treacherous in parts—lots of high-rise stairs, narrow paths where you are better off if you keep your back to the mountainside. Aw, thanks Jolandi. As I’ve said before, I would have made it to the top if I’d had enough time. Happy to you by Rinaldo from Venice Italy ☺☺ . Thanks Rinaldo. Lucky you to be in Venice. Happy Friday to you by Rinaldo ☺. Thanks Rinaldo. Happy Friday and Saturday to you. Wonderful story, Peggy. You are a very intelligent adventurer (you know your limitations). Thanks, but I have to confess that my common sense sometimes fails to kick in. Thanks! Wishing you the same. This is the real beauty of Bhutan. Come to visit once and share your experience. Crossing off Tiger’s Nest Monastery on my bucket list… no thanks, not until they put an escalator in. You just gave me the best laugh of the week! :-). I have often said this then low and behold at a couple we went to in Myanmar they actually had!!! We lived in Burma for several years in the 1980s and I don’t think there was an escalator in the country back then. I remember lots of steps in Pagan and Mandalay. Thanks so much and same to you. Love the story about the Buddha statue — perhaps it was hollow all along, and filled with water or sand, and transported ‘magically’ by its maker to hide this fact! It would make a good subject for a humorous short story! Ah yes, a perfect plot for a short story. However, Poor John assures me the statue is solid. As always, thanks and same to you. Thanks Jane. I still wish I had the skills of the ‘levitating’ Buddha. Would love to be in Bhutan.Being an Indian, we do not even need a visa and there are no restrictions but we haven’t managed to visit. Came close last year during a holiday in India’s Sikkim. Your photographs are so alive. I am glad I visited. Thanks so much for dropping by. Yes, Indians are so lucky to be able to visit Bhutan so freely. I hope you make it there soon. We entered the country from Sikkim. Those horses are pretty smart, feigning unreliability! Based on your description I would be sipping tea with you and sharing a biscuit with the horse. What a great plan! You can travel with me anytime. Stunning! That gave me a little taste of a wonderful travel! Thanks so much for stopping by. Bhutan is amazing. You are most welcome to accompany me. Amazing adventure…and wonderful description of your journey…I felt I was there with you! I understand their thinking of “no photos”—I attended my daughter’s wedding two weeks ago and did NOT take any photos—I told myself I was going to be PRESENT and I am glad I followed through with my own advice. You are blessed to experience so many travels and cultures! Thank you for sharing! Sometimes I understand photo restrictions and sometimes I don’t. Just today I was in a place that allowed photos, but in a particular section there were signs everywhere saying ‘No flash’. Every second numbskull was using a flash. You and I know that a flash can damage the precious artefacts. And sometimes I think the photo ban is just so they can sell postcards. But in the case of religious sites, I understand their concern. As for a daughter’s wedding. Did you read the post about us missing our own daughter’s wedding? She sent me a few photos and asked that I not post them. Maybe someday, she said. I’m cool with that. Yes, I understand the damage of flashes to photos…and art works…LIGHT is illuminating but can damage as well…I guess that would be true when someone is TOO HONEST—do you think that is possible? I tell my daughters, discretion is the better part of valor…However, I think they are too young to get it! I have three daughters. No, I did not see your post about missing your daughter’s wedding…awe…sorry for you…direct me to it and I will read it. There are TOO many people these days who have no common courtesy. And yes, they have no regard for respecting restrictions…all too common in the USA…I wish I could move! You probably are on to someothing with the postcard sales! LOL Would not surprise me. When I lived in Kenya for almost three years, each time I would go to a WONDEROUS SITE—and this was 40 years ago!—one had to pay an entrance fee just to look at Thomson’s Waterfall! IT was beautiful! Funny it is named after a Scottish man. But I guess a person cannot blame them for wanting to make some money. Oh my, don’t get me on my soapbox about common courtesy and the all-too-common belief that the world revolves around a single person. But with you as their mum, your three daughters will come to understand discretion. It will be a credit to you. I understand admission charges for most sites. They need to maintain the premises, have cleaners, lighting etc, so I also understand when a national doesn’t have to pay, but foreigners do. The nationals should be helping to pay upkeep through their taxes. Oh Peggy you are sincerely blessed to have enjoyed so much travel! Your photos are stunning as I’ve come to expect and I appreciate a more realistic version of the climb up. Thanks Ginger, I like to tell it as it as I find it. And yes, we have been very lucky to travel so much. Dance, drama, music, fashion, religion—Bhutan’s Paro Festival | Where to next?